At best, my design theory work tends to get mixed reviews. It’s my belief that if any creative work fails to connect with people, it’s the fault of the communicator. As a writer, you’re setting out to connect with people, so if you fail to do that – regardless of your reasons/explanations – it’s your fault. For the past few years, one of the most significant factors in this disconnect I’ve experienced has – to some extent, at least consciously – eluded me. I’ve always known that many videogames are primarily toys (obvious examples being Minecraft or Grand Theft Auto), but what I failed to realize is that nearly every videogame ever made is essentially functioning at the “toy level” (which I’ll explain in a moment). I failed to realize that even supposed “strategy games” like Starcraft, Civilization, X-Com or Street Fighter are all primarily toys, despite the fact that they have many markedly game-like features and even market themselves as strategy games. This caused me to raise concerns that failed to connect with people, because I was looking at them as games, whereas everyone else was looking at them as something much more like toys. In addition, my criticism was actually backwards. I was complaining about the elements that damaged the game, when I should have been complaining about the elements that damaged the toy. A huge point of contention has been my position on traditional videogame-style asymmetry. In 2013 I wrote an article called Debunking Asymmetry, which explained the problems I have with asymmetrical forces in games (i.e. selectable races, characters, classes, etc). The article got a lot of attention from some well-known designers like Jon Schafer, Greg Costikyan, Raph Koster, and David Sirlin (who wrote a dismissive and mean-spirited comment which got upvoted like crazy, despite the fact that it didn’t really address my article’s points). When I read these comments, I was really kind of confused. One of my concerns I raised in the article was what I called “playing designer”. Since the objective in, say, Street Fighter, is to win the fight, then I should choose the best character (or at least, the character I am best with) every single time. In either case, the actual “choice” of who to pick is therefore non-existent/solved. Only if you decide to sort of step back and ask, “well, would it maybe be more fun for me to choose a character other than the best / that I am best with?” do any of the other choices become viable. In that situation, you are making a design choice – what are optimal rules for this coming match in terms of my experience, which is markedly different from strategic choice in a game, which is always about finding more optimal moves. I brought this up, but it didn’t connect. Why not? Well, because everyone else was already assuming that of course we all make design choices. We make design choices all of the time in videogames – we’ve grown up making design choices. Early popular videogames like Super Mario Bros., The Legend of Zelda and Final Fantasy all trained us to constantly make design choices – to make sub-optimal strategic choices for the sake of keeping ourselves entertained. We’re used to making sub-par moves for the sake of “fun”. Sometimes we refer to this as “going for style points”. 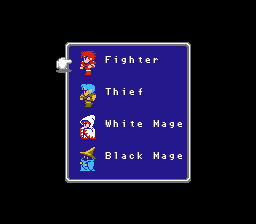 Using four fighters in FF1 is both incredibly strong, and incredibly boring. Further, we even have a derisive term for people who actually try to play optimally: “min-maxing“. Min-maxing refers to the act of picking the best stuff, especially in a role-playing game such as Dungeons & Dragons. D&D is inherently a role-playing toy, so if you’re “playing to win”, you’re playing wrong. Most game players and game designers are not thinking about “games” – even “strategy games” – the way I do. They are thinking about them fundamentally as toys, and since toys are so loose and formless, it’s much harder to make clear statements about what works or doesn’t work. I only know of one sure-fire way to fundamentally break toys, which I will get into in a moment. Another example is randomness, and my positions on that. If you are thinking of something as a strategy game, hard output randomness isn’t desirable. But in a toy? Sure, why not! Well-known designer and theorist DanC once told me that I was (paraphrasing here) “obsessed with attributing value to tools”. His point was that randomness is a tool, asymmetry is a tool; everything is a tool and, echoing Shay Pierce’s sentiment, you might want any of these things in your system. If you are operating on “the toy level” – which basically every designer on earth with the possible exception of some Eurogame / abstract designers – this is true. I really enjoyed The Lego Movie. The theme, or controlling idea of the movie was pretty powerful: that the spirit of Legos was creativity, exploration, doing things your own way. The primary force of antagonism in the film was essentially instructions, or the super-glue that holds Lego bricks in place once set. In the first act, the main character lives his life by a strict set of rules, and throughout the story he learns to embrace his creativity. Wild, loose creativity is, after all, at the core of the spirit of legos, and of toys in general. As I said earlier, I only know one sure-fire way to break a toy. Toys are very low on the ladder of forms, very simple, and thus, very durable. Just about anything you can imagine can work in a toy, except for one thing. Toys break when you give them a goal. When you give a toy a goal, it technically becomes some other form – a puzzle, a contest, or a game. The problem is that the loose, scattered bits of rules everywhere that could have made for a good toy is not strong enough to support any of those other higher forms, all of which require way more systemic support to operate properly. Things end up hobbling along and working, but only because of the efforts of the player to ignore your goal entirely (and simply play with it like a toy), or worse, partially ignore the goal, which requires a lot of mental effort. This might be OK for the opening introduction to your toy – i.e. 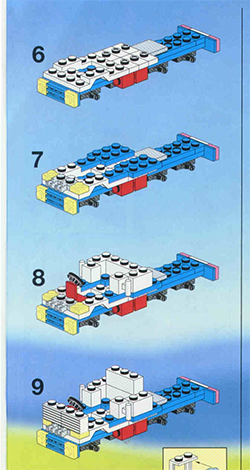 the instructions that come with legos – but you should quickly abandon any sense of a real goal as soon as possible. Some systems are very obviously toys with some goals slapped onto them. Probably the most obvious examples of this would be things like Grand Theft Auto and The Legend of Zelda. In these systems, we have a great big open world with all kinds of stuff to explore and things to do, which is then flattened out into a linear, rote chore by the missions and fetch quests. In GTA, I can go off huge ramps and drive around on rooftops and explode and jump out and parachute into the water – all kinds of fun “play” activities. Nothing takes the fun out of those like a big yellow arrow telling you exactly what to do. RPGs, too, also have this quality. I always remember being frustrated, even as a kid, that so many weird, interesting, almost tactical spells that technically existed in Final Fantasy took a direct back-seat to something like FIR2, which just nukes them with damage. I mean, the point of Final Fantasy is to get to the end, right? To “beat the game”? We certainly don’t want to die and be “set back” further from the goal, so we should just use the damn fire spell, not muck around with other stuff that might be more interesting. At the other end of the spectrum, though, you have supposed “strategy games” like Civilization. But now I have to do a weird mental gymnastics routine where I am trying to win, but I’m not trying to win too hard. In Civilization, I should probably look up which of the six victory conditions is the most consistently easy to win and with which nationality, and then just pick that nationality every single time and do nothing else, ever. It’s funny – that sounds like such an alien concept, doesn’t it? I’ve played thousands of hours of various Civilization games and I did nothing of the sort. I always wanted to “try out” all the different factions and “go for” all the different victory conditions to see. What I was doing was not “trying to win”. I was “exploring the edges”, as one does with a ball or with Legos. Even with highly competitive games like League of Legends, the reason they have so many characters and so many items is so that you can constantly “explore edges”. It only hurts a strategy game to have that much content, in that actual balance goes way out the window. Someday, when Riot stops issuing weekly balance patches (which makes solution a moving target), the community will quickly settle on the top few team builds, and soon after that, the game will die off, with some other “less-explored toy” taking its place. When I say that videogames are broken toys, of course they aren’t so broken that they can’t be enjoyed (at least, not the popular/successful ones). Players inherently do a lot of the lifting themselves with toys, so going the extra mile or two to ignore / partially ignore goals isn’t that hard to do, and basically everyone is doing it right now and will continue doing it for some time. That doesn’t mean that we shouldn’t improve the situation, though. We also need to get over our anti-toy bias. Players, particularly adults, are a bit ashamed of playing with toys, and I think that needs to change. There’s nothing wrong with playing with toys. Some might be wondering “how would you do something like Magic: The Gathering without a goal?” There’s a lot of answers to that. I believe there’s a variant of Magic: The Gathering that automates the actual “match” aspect. This might be a start; basically it’s a “deck-building toy” – you build a deck, and instantly get a number or some other feedback that allows you to explore the edges of “all Magic cards”. The immediate response to that idea is likely, “well, that wouldn’t be fun for very long”. I agree – the problem is that Magic isn’t really that great a toy. The designers themselves weren’t entirely thinking of it as one; if they had, it’d probably have way more edges to explore. Forget completely about balance or depth or dominant strategies or any of the things that one worries about when building a strategy game. Because toys are a primitive and simple form, it’s not hard to create a functional toy. However, creating a great toy – such as Legos – is pretty hard. Like anything else, you need some “core idea” that ties the entire thing together. Toys can – and should – be elegant, just like any other human creation. The modern player has been raised in a world of toys. Pure strategy games, like some designer boardgames and my own Auro, can come off to today’s player as unforgiving, difficult, strange or even “feeling like work”. In time, when we have more examples of pure games, I expect this problem to diminish, but for now, I think it’s an issue. The next thing I make with my development team, Dinofarm Games may end up being a pure, unconflicted toy. Toys are the most common language people speak these days, and part of being a good communicator is speaking to people in a language that they understand. If we want to make toys, we need to really focus on that. Or alternatively, focus on the other forms. Portal and Professor Layton do a great job of focusing on being puzzles. Guitar Hero and Dance Dance Revolution are great, focused contests. My favorite form by far are games, so I would love it if we could start producing some unconflicted, pure strategy games as well. Outwitters is probably the closest thing to a pure, unconflicted digital game, but even it has asymmetrical forces. I hope that in the future, developers take the point of The Lego Movie to heart. Stop spraying glue all over your toys. Thanks to my Patreon patrons for their support! Click here to become a supporter.